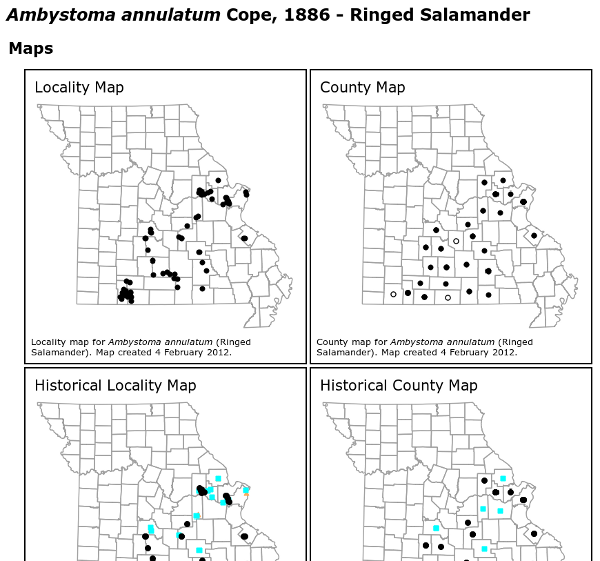 The Missouri Herpetological Atlas Project (MOHAP) was initiated in 1997 as a result of the desire to obtain and easily update detailed distribution maps for Missouri (United States of America) amphibians and reptiles. A database was established to store all valid localities, including records published in historical literature sources and specimens vouchered from museums. From the database, a series of maps can be produced representing both locality records and «county records» for each species. MOHAP hosts a web site at http://atlas.moherp.org/ that describes the project in detail and displays a variety of static maps, all produced by QGIS. An atlas, published as a downloadable PDF, is released periodically as a gratis publication in the spirit of open access to scientific research (Daniel, R.E. and B.S. Edmond. 2012. Atlas of Missouri Amphibians and Reptiles for 2011. <http://atlas.moherp.org/pubs/atlas11.pdf>). Published maps are used by field biologists, land managers, and others to better understand species” distributions in Missouri. As of February 2013, the MOHAP database contained 31,495 entries representing the specimens housed in 34 museum collections and cited in 32 historical literature sources; 5,118 documented county records; 6,884 unique localities; and 12,866 unique species / locality combinations. The state’s herpetofauna consists of 113 species. The process of creating maps with QGIS starts with data stored in several PostgreSQL tables, spatially-enabled with PostGIS. Because maps are static and ultimately destined for either the web or a printed atlas, they are generated automatically for each species using a custom QGIS Python plugin (Figures 1,2). 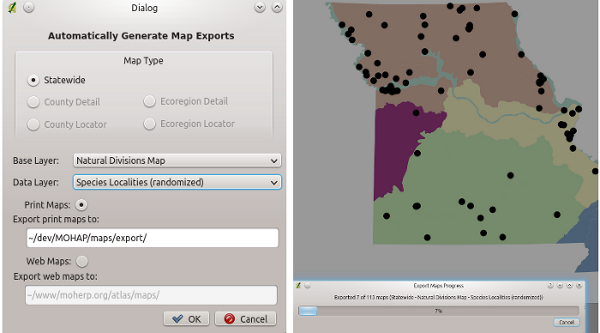 Interfaz de usuario para personalizar la generación y exportación de mapas, los mapas son generados y exportados en un proceso batch. Los mapas finales de especies tienen una clara apariencia profesional (Figura 3). Para un mejor entendimiento de la distribución de especies, una serie de mapas base son creados y etiquetados (Figura 4). Debido a que los estilos de forma son manejados dentro de cada capa de datos, las capas del mapa base pueden también ser incorporadas en un grupo de mapas de especie con un poco más de esfuerzo. Los mapas se muestran como imágenes estáticas. 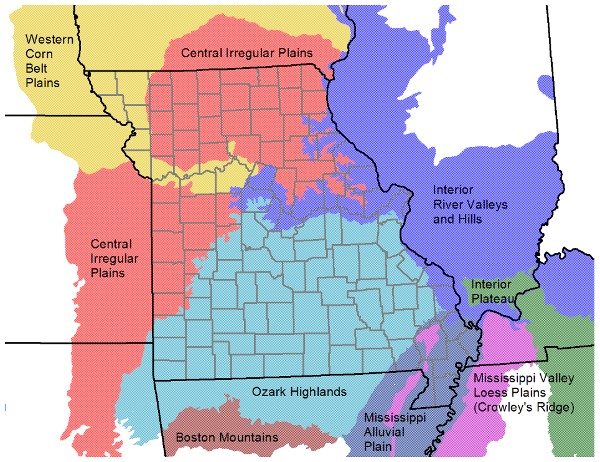 Mapa Etiquetado Nivel III de Ecorregión para Missouri y estados vecinos. At the beginning of the MOHAP project, several commercial and proprietary tools were used to store and process data and produce maps for publication. Starting in 2007, we set about to move all aspects of the project to open source software. QGIS, along with PHP, PostgreSQL, PostGIS, Python, and ReportLab, forms the open source linchpin to MOHAP, effectively allowing the project and all data to exist free of proprietary software entanglements. QGIS contains native support for PostGIS and a Python plugin architecture, which were essential in creating the automated map generation and export. The extensive API documentation was used along with the plugin developer cookbook to create exactly what we needed for the automation. The community support is also very good and includes a huge array of shared plugins built and ready to use. Although we use QGIS in a small and specific way, its capabilities and extensibility using Python is more than sufficient to tackle larger and more complex projects. This article was contributed by Brian Edmond in February 2013. 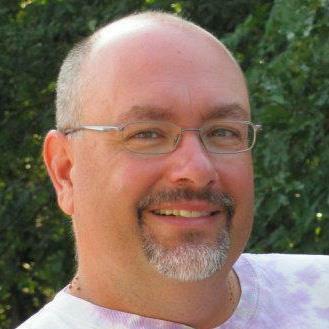 He is a Senior Systems Analyst in Computer Services at Missouri State University. He holds a BS in Wildlife Biology from the University of Missouri and has spent his career in the intergrade zone between biology and technology.